Kentish Town grew up along the London road to Highgate and became fashionable in the 18th century. More residences were established here and the area became the home "of some good families who kept their carriages and suits of servants". A hamlet in the parish of St Pancras, Kentish Town did not get its own parish church until 1784, designed by architect James Wyatt. 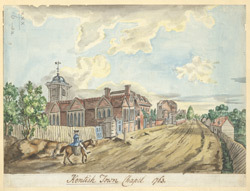 This drawing also shows the view down the Kentish Town Road and the development of houses and cottages on either side of the road.